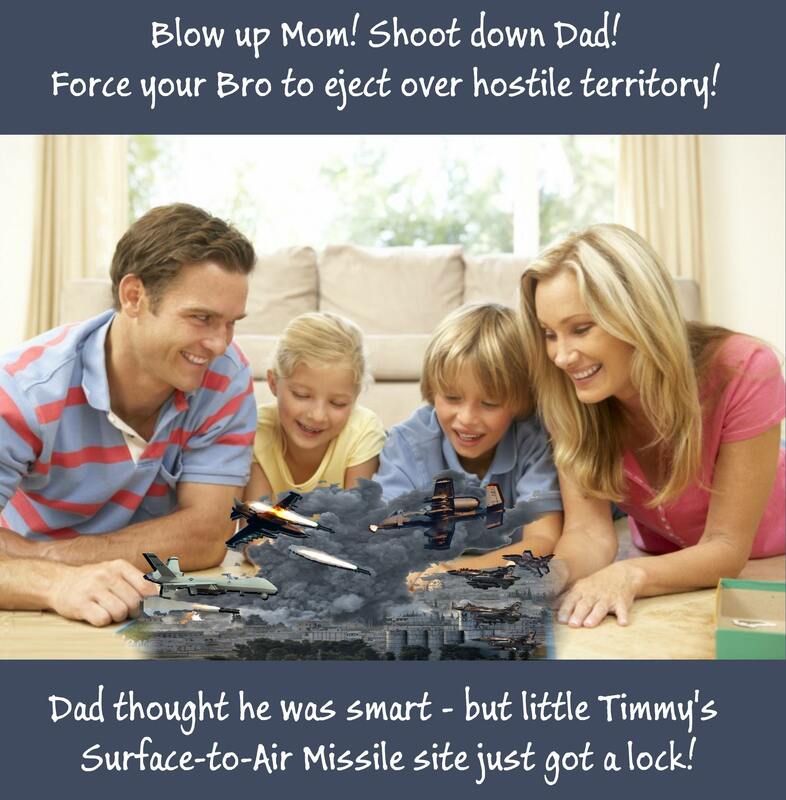 Air Strike is a simple and fun air combat game for the whole family, that requires only a regular deck of playing cards and a tape-measure or ruler. Take to the skies in modern jets of all types, launching missiles and trying to evade them! Suitable for 2 - 10 players. Games last from 5 - 10 minutes. Air Strike has a basic section with the basics of movement and missiles, then has an optional extra section which adds cannon attacks, ground attack aircraft, electronic warfare aircraft, and SAM sites. There are multiple missions tailored to 2, 3, 4, 5, or 6 players, although 7 or more can be easily gamed using a simple points system. Printable markers are provided so you can print out aircraft and missiles, or you can use toy aircraft or miniatures. A printer-friendly version is also supplied. Iliada Game Studio are beginning to make flats for Air Strike - keep an eye on them as their range expands! I might be interested in the rules if they are as simple as they proclaim, is there an AAR, rules review, rules index... Because Im tired of loads of jet games saying being simple and then being boring, complex or having absurd record keeping requirements, CY6!, AirWar:C21, Target Locked On!.... They all proclaimed it but they were more complex than usual wargames. I want a 'beer & pretzels' jet game, maybe this would fit but I need to know a bit how it works beforehand. These rules are very simple - I have played them with non-wargamer colleagues, and younger siblings (~8 yo). If you look at the full preview, you will see 80% of the rules, all that remains is the damage and evasion rules, and some optional extras and ideas for scenarios / missions. I will film an example game sometime to show how quick and easy the game is. Didn't know there was a preview my bad. Okay, sounds good then, I have to check the preview and then decide. Thanks Tom! Bought it and read it. It is as it says, there isn't a simpler game of jets out there. Perfect to play with kids / people not used to wargames. Easy to add new rules (already made a new system for damage, 3 stats for planes so it makes a difference which you use and some maneuvres to spice up the gameplay). Haven't tested the set yet in a game per se, but by how it works, I believe the 10 minute per game mark and I like the idea of a plane per player. Not recommended for people that dont like alternative systems for dice, this uses poker cards, it reminds me of Wings of Glory with it's use of cards instead of dice. Have to say the "optional rules" part is formatted weirdly, even somewhat confusing, but since the rules are so easy it's not a biggie,I would dare to say that this, even though it takes more pages, it's easier than FUBAR, I really mean it. Also I think it's a fair price, even though it's just like 7 pages, it includes paper counters and the pdf is quite gorgeous for what it is. ...See more /> If you, like me, use 1/600 planes, a coffee table is more than enough making it be an amazing "on the go" wargame, can be played almost anywhere with just two planes, a poker deck and something to measure. If you want to spice up I recommend adding a number damage system, special maneuvers depending on the movement card and giving some planes more resilience or speed than usual. Also making counters is easy, just buy some 1/300 missiles, put them in a base and write the appropiate code, there ya go. I would recommend it, once it appears on BoardGameGeek I will make a better review and post my "addons" to the game. Thanks for the review Karlos, glad you like the look of the rules. You can post your review here in the Review tab if you like, and leave a rating, it would be much appreciated. I am adding this game to BGG at the moment, the entry should be up and running in a few days. definitely agree that this game is great for a small table and 1/600 miniatures! Is there a list of aircraft & do they have performance ratings that affect gameplay, or is gameplay more generic? This game is a bit more generic, there is a Fighter, Ground Attack and Electronic Warfare aircraft, each with different capabilities reflecting their role.